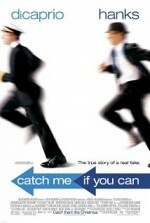 Watch Catch Me If You Can: New Rochelle, the 1960s. High schooler Frank Abagnale Jr. idolizes his father, who's in trouble with the IRS. When his parents separate, Frank runs away to Manhattan with $25 in his checking account, vowing to regain dad's losses and get his parents back together. Just a few years later, the FBI tracks him down in France; he's extradited, tried, and jailed for passing more than $4,000,000 in bad checks. Along the way, he's posed as a Pan Am pilot, a pediatrician, and an attorney. And, from nearly the beginning of this life of crime, he's been pursued by a dour FBI agent, Carl Hanratty. What starts as cat and mouse becomes something akin to father and son. One of my best films. Love this. A must see!!! !